If you are a long time reader of my reviews, you will note I like to explain how I came to acquire and read the book. This review of Altered Carbon is no different. I read many books, mostly fiction. Of the fiction 99% science fiction. A friend told me he was taking a break from non-fiction and reading Altered Carbon. Based on his interests I immediately assumed the book was about guns, spies, hunting, fishing or some other topic men more manly than I read. He said no this is a science fiction book transforming into a TV show by Netflix. After my initial shock of him knowing something Sci-Fi related I didn’t, I decided to order the book for my Kindle. Altered Carbon is in the future. It is unclear when exactly, my best guess is 23 something. There are references in the book about dates and ages of people. However, I could not find any reference to the exact date. It bothers me a bit to be honest. When you read chapter one “Arrival” if I were Kovacs I would ask where am I and what is the date? Who is Kovacs? Takeshi Kovacs is the protagonist of the story if such a thing exists in this book. He is a human born and raised in a colony world. Very simple character backstory of being poor having bad parents and joining a military-like organization to get his life together. The organization that he joins is interesting and adds to the story throughout the whole book. Most good science fiction books have some future technology which is fun to read about and enhances the story (think light-saber or transporter). Altered Carbons “killer tech” is a device called the sleeve. The sleeve stores a person’s consciousness in a digital format. With the right equipment, consciousness can move from one sleeve to another. The sleeve offers everything from immortality to easy transportation in a digital format to other worlds. The only requirement is there is storage or another sleeve to be downloaded into on the other side. This concept of a digital consciousness is not new. There are many books and movies which tackle the topic. I don’t recall any other book that used the concept of a sleeve. At least for me, the concept was unique and very cool. Altered Carbon is probably best described as a futurist detective novel. Kovacs is brought to earth to solve a crime the police do not think happened. Without giving any spoilers pay close attention to the details. Almost every scene in the book is related to another scene, and the details are important. The book is not Hobbit or Game of Thrones complex however it does wear on you after awhile. My one criticism is the book was a little complex and slow at times. I would bet Netflix will rewrite and reimage a few spots to avoid filler episodes. To underscore my point when I finished the book and reached back out to my friend he was about 50% complete and struggling to continue. My advice to him and you is to power through it. It will get better and worse and then finish strong. Since Altered Carbon is becoming a show, I decided to look up the actors. What I found was a little shocking. There are a few characters not in the book mainly Poe, Captain Tanaka, and Okulov. These unknown characters seem to have starring roles with 6 or 7 episodes equal or exceeding Takeshi Kovacs. Very strange. Kristin Ortega is only granted four episodes. In my opinion, Ortega is the balance which makes the book good. I’ll reserve judgment on the actors chosen most of whom I have never heard of. I always struggle with books made into movies or shows because the actors never fit my visualization of the characters. Do I recommend reading the book? Yes. You can pick it up on Amazon here. 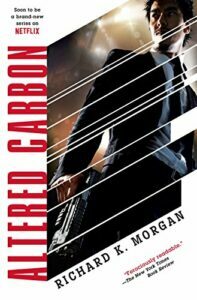 Altered carbon is not the best book I’ve read but it is very good. Plus, it will be fun when Netflix changes it all and we can all complain about it.